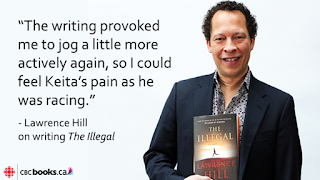 Lawrence Hill, seems to be a household name in Canada. Author of The Book Of Negroes and now a Canada Reads Finalist with his new book The Illegal, he is the one writer who is engaging and thoughtful (I should know, I was on a CBC panel discussion with him and host Mary Ito). "I know there's this hilarious stereotype about writers knocking back whiskey and having a grand old time, but I tell you if I was knocking back whiskey I sure wouldn't be writing anything. I need my faculties intact and I can't imagine drinking and writing. I like coffee and tea and I make a killer ginger drink. I just boil up ginger and put some honey and freshly squeezed lemon in it. I make a cup or two of that. I call it Larry's Ginger Kick." SukasaReads Review of The Illegal.